Swimsuit and shorts season is just around the corner. So, if you are needing to get in more workouts, you might also need the gear to do it. Why not allow Moddell’s to give it to you for free!? 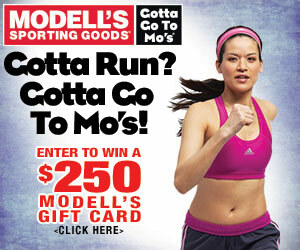 Moddell’s has a new, recently expanded women’s product line they are giving you a chance to win a $250 Modell’s Gift Card. Simply LIKE them on Facebook and then enter the information requested (name, email and zip code) and you will be entered for a chance to win a $250 Modell’s Gift Card! Not only that, everyone who enters will get a coupon valid to save $10 off of your $50 purchase – so you can get busy shopping!! Someone needs to win — why not a Penny Pinchin’ Mom reader? Visit Moddell’s Sporting Goods to enter!